A History Of Hollywood's 'Lovable Drunk': Arthur Doesn't Booze Here Anymore Movie critic Bob Mondello takes a moment as Arthur is remade to consider the first Arthur, who was one of Hollywood's few rich, lovable drunks. Poor but lovable, that was something else entirely. The notion of a "loveable drunk" was always problematic, at least to people who've come into contact with actual drunks. But the way Dudley Moore played the original Arthur, the character seemed aware that he was a mess from the very first scene. From the moment he was heard cackling from the back seat of his very fancy car, he was the picture of the sad-sack but jokey drunk. And where had we seen that before? Well, in Shakespeare's Falstaff, for starters, and the tipsy disciples of Dionysus in Greek comedy. And of course, in vaudeville. In fact, one American vaudevillian, W.C. Fields, leapt from stage to screen right in the middle of Prohibition, tippling all the way. If tragedy shows us at our best — falling, but from a great height — comedy tends to show us at our worst, staggering and reeling stupidly in the gutter. Alcohol is an effective tool for putting someone in that condition, so many comics play individual drunk scenes. But few are willing to stay in the gutter with alcohol to the point where it defines the character. Chaplin's "little tramp" would never have been popular had he been "the little lush." When TV came along, excessive drinkers were relegated to the sidelines, where they fell into categories: the '50s bar-hound on The Jackie Gleason Show, the '60s town drunk on The Andy Griffith Show, and the '70s sophisticated lush on The Dean Martin Show. But even Dino didn't lean too heavily on the tipsy stuff. It takes special material, and a special kind of actor, to make long-haul inebriation play as something other than self-destructive. The one guy who indisputably managed it was Jimmy Stewart as Elwood P. Dowd, a barroom regular whose best friend is a six-foot-tall invisible rabbit named Harvey. But Harvey, you'll note, was gentle and sweet. It was non-threatening tipsiness. Hollywood left the "problem" part of "problem drinking" to serious pictures like The Lost Weekend and Days Of Wine And Roses, while comic characters rarely suffered much more than a hangover until the 1970s, when a new drunken chant rolled in, and Hollywood reimagined drunkenness with a single word, repeated over and over. That word, of course, was ... "To-ga!" Animal House, in fact, reveled in the destructive side of drinking. Its humor is in the mess being made by loud, reckless alcoholics in training. It was a seismic shift, widely imitated, and it came just three years before the first Arthur. The Animal House effect likely accounts for some of the choices that were made in conceiving Arthur's title character. 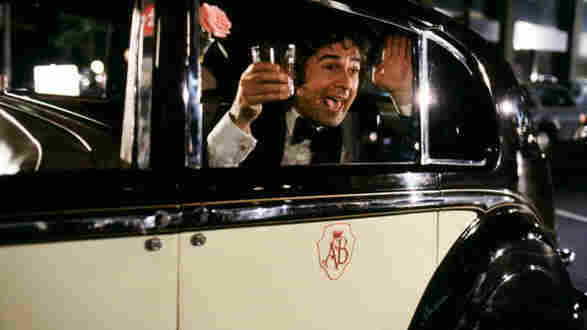 The screenplay has Dudley Moore drinking not just from bars, but also from a well of self-pity. Since he knows he's pathetic, the audience is off the hook, not required to judge him more harshly than he's judging himself. That said, there are scenes in the first Arthur that would be inconceivable today — Arthur drinking and driving, for one. Today, a whole generation has grown up hearing, "Friends don't let friends drive drunk." And there's no drunk driving in the new Arthur. In fact, if you were just going by the trailer, you'd swear there was no drinking in it at all. Russell Brand is shown acting childish, not drunk. He's an overgrown kid more than a substance abuser. Why hide Arthur's drinking now? Because these days, while tipsiness can still make us laugh, an alcoholic is just sad. Of course, the obsolescence of the hilarious, lovable, largely unrepentant drunk doesn't mean filmmakers can't find other ways of making characters reel stupidly. For proof, you need look no further than the title of another film opening today — the medieval stoner comedy Your Highness.